Continuing the Japanese theme, we move on to the other major producer – Nikka. Nikka was founded by Masataka Taketsuru, one of the team who helped set up Suntory’s first distillery in Yamazaki so it appears that the Japanese whisky industry is as incestuous as the Scottish! 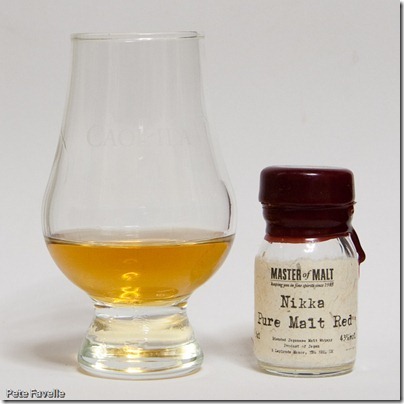 This is the Nikka Pure Malt Red, a non vintage 43% ABV whisky. The ‘pure malt’ name is another way of saying ‘blended’ – in this case, whisky which is primarily from their Miyagikyo distillery but with some from Yoichi in there as well. A golden colour in the glass, it has a nose that frankly says ‘drink me’. Creamy, caramel and a whiff of vanilla and just a hint of summer fruit lurking beneath. With water, the grain puts in an appearance and there’s a freshness too, with definite lemon citrus notes. In the mouth it’s light and sweet, if a little ephemeral. Water doesn’t change it dramatically but as it cuts the alcohol back a touch it just makes it all the more drinkable. It’s relatively short lived and has a very pleasant, easy drinking ‘softness’ feel to it. Although entirely different in character, it has the same ‘session whisky’ feel as Bruichladdich Waves – it’s light, smooth, very drinkable and I suddenly wish the bottle had contained more than 3cl. I’m looking forward to my Japan trip more and more!